READY SEAL DECK SEALER-5 GALLON PAILS! Ready Seal Deck Sealer & Stain In 5 Gallon Pails! Home : Ready Seal Deck Sealer & Stain In 5 Gallon Pails! Ready Seal Deck Sealer And Stain From Sun Brite Supply Of Maryland! all-in-one deck sealing oil that's easy to use. NOTE: We are not currently shipping Ready Seal to states west of the Rocky Mountains. Ready Seal is consistently the runaway favorite oil sealer in contractor polls. Contractors agree, Ready Seal deck sealer has changed the wood restoration industry! It is the most "contractor-friendly" deck sealer for almost any type of wood. Finding a deck sealer that can restore decks, fences and other wood surfaces with excellent protection from the elements is difficult to do but this deck sealer is made for almost any wood restoration job. We love Ready Seal deck sealer and stain, and we have worked hard with contractors since 1998 to help them use this fine product. What makes Ready Seal work so well is the paraffinic oil base combined with extremely fine pigments and imported resins. The waterproofing and anti-graying properties last for up to 2 or 3 years on horizontal surfaces and up to 4 or 5 years on vertical boards. The color tends to lighten over time, and most of our deck customers prefer that we re-treat their decks about every two years. The unique resins and oil means faster applications and more complete penetration. This professional deck sealer also contains outstanding UV protection, excellent mold and mildew inhibitors, and is fully VOC compliant (very low in ozone-depleting chemicals). No other deck sealer is designed to stop runs, laps and streaks before they start - and the deck is ready for use and ready to stand up to rainy weather in just 15 minutes! Ready Seal is Cited as one of the preferred penetrating oil sealers by "Wood" magazine, Ready Seal will make deck sealing a breeze! Available in 8 customer-pleasing, natural, semi-transparent stain colors. NOTE: UV protection is very limited in the Golden Pine color, and not included at all in the Clear. 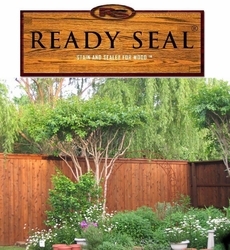 We do not recommend the use of Ready Seal on extremely high tannin woods such as redwood. 5-Gallon Pails feature Easy-Pour, no-spill spout. Coverage varies by type and condition of wood. Approximately 150 sqft/gal. If you request special services, such as liftgate service, island delivery, or delivery to a residential address there may be additional shipping fees. Contact us at 301-519-9274 for an exact shipping price. The colors shown on this website will vary from the actual colors achieved because of different wood types, the age of the wood being treated, and the color settings of your computer monitor.